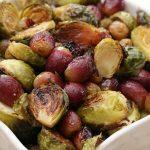 Home Recipes Dinner Recipe: Roasted Brussels Sprouts with Grapes. Delicious!! All I can say is yummmmmm…… Looking for a new way to cook Brussels Sprouts? 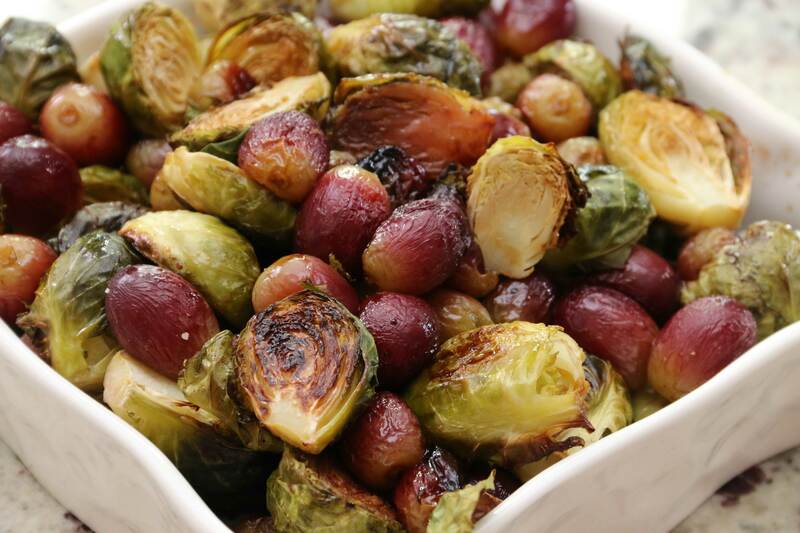 Trying roasting Brussels Spouts with grapes. It’s a low calorie, nutritious meal. Consider roasting grapes and adding them to a salad or sandwich. When grapes are in season, I freeze them and then use those for roasting. I love fresh grapes just as much as I love roasted grapes. The best way to freeze grapes is to wash them and let them dry on a towel. Then I can take them off the vine and lay them on a roast pan in the freezer, but more times than not, I just throw them into a ziplock freezer bag and place them in the freezer on the vine. It works either way. I am more a kick the can down the road kind of person. If you freeze them on the vine, your hands may get cold when you are taking them off the vine to roast or snack on them. Look at this amazing sandwich. 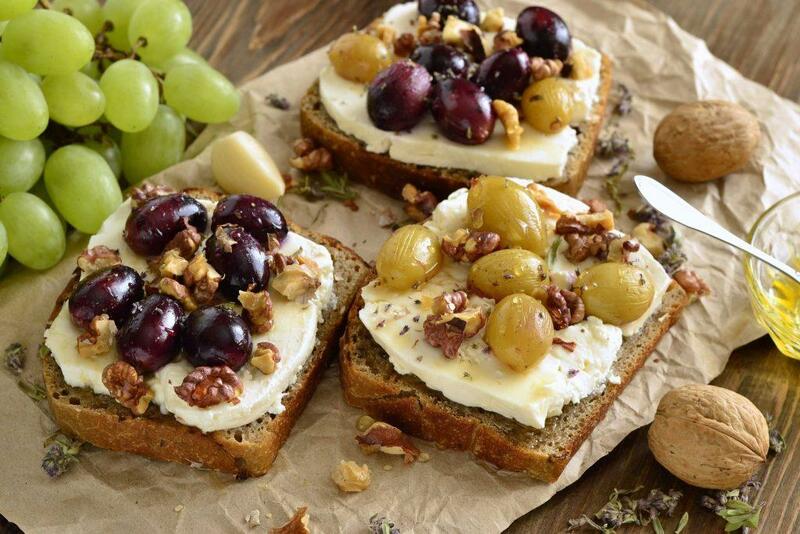 Add some chopped walnuts, drizzle a little honey, with a beautiful cheese or spread and add some roasted grapes on top. You’ll wow any crowd and people will never know how easy this way. Once you freeze your grapes, you can do so much with them. Plus, they make such a yummy snack all on their own. Be sure to check out our video on how to roast Brussels Sprouts 4 Ways! Plus, get inspired to serve up Brussels Sprouts throughout the week. Halve your Brussels sprouts and pop off your grapes from the vine. 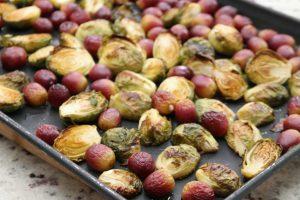 Evenly spread out your Brussels sprouts and grapes on your roasting pan. Drizzle your oil and mix to coat everything. Roast for 26-30 minutes and then serve. This post contains affiliate links through Amazon. If you purchase a product through this link, your cost will be the same, but I will receive a small commission to help with the operating costs of this blog. Thanks for your support! We have hand-curated all of our products to make selecting the right products for your family easier.